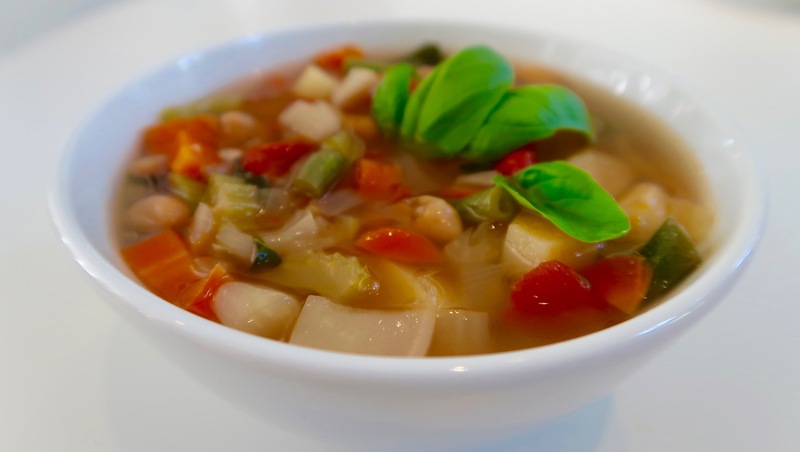 My Healthy Hearty Minestrone soup is a family and friends favorite. Who doesn’t like a hearty soup that’s packed full of gorgeous fresh organic veggies, beans, and noodles of your choice? You can also easily customize your soup to suit your preferences, for example – don’t like beans? Take em out. Or, don’t want pasta? Just omit. But here’s the absolute key to a good Minestrone: A GOOD STOCK! And there is nothing like a homemade one. So the first recipe I’m giving you is a fantastic stock/broth. My Mother taught me to make vegetable broth when I was a kid. She wouldn’t dream of buying the stuff because she’s frugal and she loves to put scraps to good use. So do I. Buying cartons of organic veggie broth is very pricey, creates a lot of waste, and add a nasty heaviness to your shopping bags. So, win/win. The basics ingredients of a good stock: onion, carrots, celery, potato, leeks, carrot tops, bay leaf, mushrooms, parsley, whole head of garlic, (or any fresh herb you have to hand). Now remember, these can be scraps, like ends of carrots, broccoli stalks, or any veggie you migh have hanging around in your crisper drawer). Obviously the scraps need to be thoroughly washed. The only scraps I wouldn’t recommend using are potato peelings. If you don’t have scraps, you can buy the basic ingredients. Great additions to dial up the flavor: a handful of dried mushrooms, 1tbsp miso paste, 1 tsp dried bouquet garni. Seasoning: Season with sea salt and pepper to taste after your stock is done. You might also want to add a touch of sweet to balance the flavor – This could be a couple of tsp of maple syrup or coconut sugar. In a large 8-quart stockpot, add about 4 – 6 cups of cut up veggies and/or scraps. Fill the pot up with about 6 quarts of filtered water. Allow to cool before ladling into deli containers, BPA-free plastic containers, or glass containers. Freeze. I recommend using a number of different-sized containers so that you have the right amount of stock for whatever you are cooking. Heat the oil or broth in a large stockpot or slow cooker (I love my 360 Cookware slow cooker as it goes from stove top to heating element. It’s the best-made one I’ve ever owned. And you get 20% off if you add the coupon code SOPHIE20 at checkout). Add the onion, celery, and carrots, and gently saute until they are soft, not brown. Add the remaining veggies (except for the green beans and Kale), and broth. Simmer on a medium heat for 20 minutes. Or on a low-medium setting on your slow cooker for about 3-4 hours. Stir in the pasta if using and season to taste. Garnish with fresh herbs, and/or vegan Parmesan Shreds. For many other healthy, plant-based recipes, and how to get started with plant-based essentials, grab my FREE starter bundle, which includes 3 free e-books!